"In the land if the blind, the one-eyed man is king"
On the web, e-commerce sites that implement structured data markup (rich snippets) the smartest way often beat those that don't. 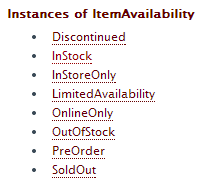 As you can see, the listing tells you the number of items, their names and prices right in search results. That's why structural markup is so important for e-commerce sites – in present-day SERPs, it's often the deciding factor that separates a click-through from a hit-next. What kind of rich snippet formats could an e-commerce site benefit from? Let's consider some popular options. As I'm writing this post, it's almost St. Valentine's Day. So, let's search for some holiday deals and see what type of interesting offers we find. However, apart from RDFa markup the site's webmaster used to highlight website-related information, it seems that Google has figured out the number of items, as well as the details of the first 2 deals on the page on its own. As Google these days recommends using Schema over other available structured data formats (which doesn’t mean it discontinued support for older ones), using Schema.org/Offer to mark up a holiday offer or another special on your page would be your best bet. Would you like the name and the price of your product to be visible in search as they do for the eBay site? Then you should look into the Product Schema at Schema.org/Product. If your website has reviews and ratings, you can make information about them appear in search results – and you can do it in a number of ways. And, if we follow the "More information" link, we’ll see the formats Google recommends using to make ratings/reviews appear as rich snippets, and how to avoid some common errors. As far as I've observed, product images and videos do not appear in Google's search results that often (feel free to prove me wrong on this). This is probably because, unless one is searching for something very specific, most results pages have multiple products, and Google can't choose just one image or one video to represent the entire group of items. However, if we are talking about a page that features an individual product, an image/video rich snippet is more likely to appear. However, if we look into the code, we'll see that, most likely, responsible for the snippet is the Recipe Schema used there. Now, because the page is about anything but a food recipe, the site’s webmaster should probably replace the format with the more appropriate ImageObject Schema or specify the image within the IndividualProduct format. Google Shopping has been around for a while, but it wasn’t until the entire section went pay-to-play (for advertisers) that Google really invested in policing Shopping results quality and user experience. Although many were unhappy that product search went paid, the vertical has definitely become more efficient as the result. If you run an e-commerce site and would like more exposure in search engine results, using structured markup could really make a difference. And, if it's hard for you to implement Schema on your site for technical reasons, consider using Structured Data Markup Helper, a tool by Google that allows one to easily tag the necessary data with correctly formatted tags.